Despite talk about the London bubble, worries about high house prices and the shortage of housing has become a national issue. Concern about house prices and the availability of homes has spread across the UK, with almost all areas citing high property prices and the ability for first time buyers to get on the property ladder as a serious housing issue in the housing market. As the housing market gathers pace outside London and the South East, those in the East Midlands, Yorkshire, the North West and Wales think that house prices are a serious problem in the housing market at the moment, according to the 2014 Annual Homeowner Survey. 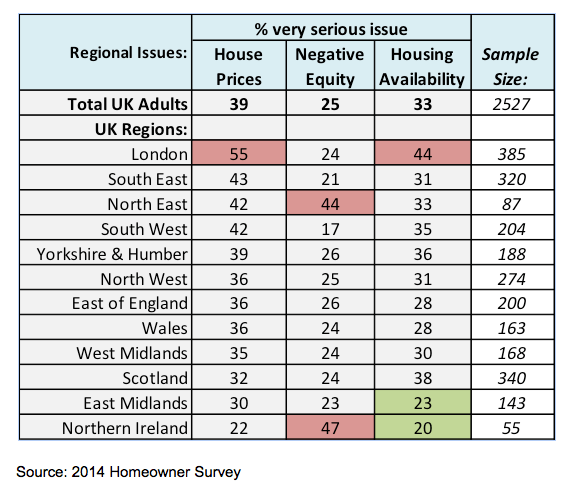 In the North East of England and Northern Ireland, negative equity is more likely to be seen as a very serious problem than elsewhere in the UK. While the appetite to own your own home is on the rise, house prices are of particular concern to those aspiring to be homeowners. Our monthly House Price Watch, released today, reports the biggest monthly rise in house prices of the past 15 months (+1%) and an annual rise in house prices of (+6.9%). Regionally, house price growth has spread to all regions of England and Wales except the North East. House prices in London continue to soar with price growth double that of any other region. Demand continues to outstrip supply and reports suggest that the proportion of properties achieving the asking price is at its highest level in a decade (over 99% in the Capital). 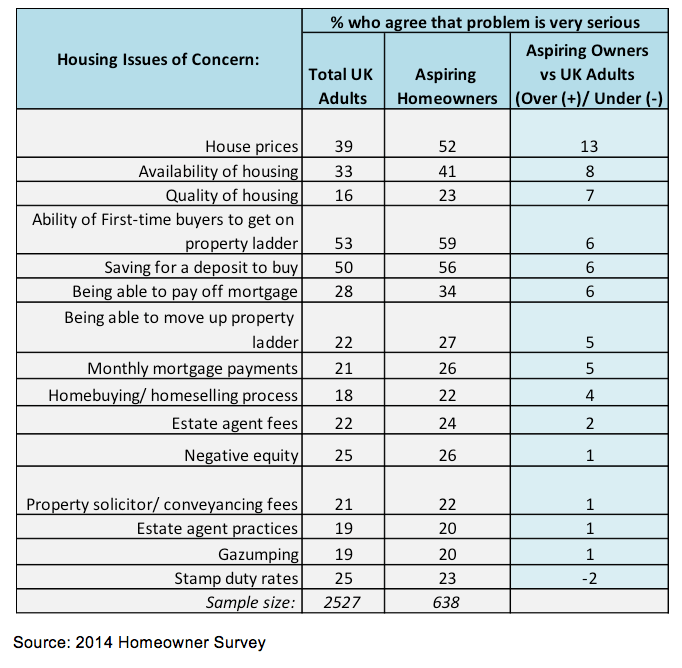 All figures in the 2014 Homeowner Survey, unless otherwise stated, are from YouGov Plc. In 2014 total sample size was 2,527 adults. Fieldwork was undertaken between 18th-20th March 2014. And in 2013 total sample size was 2056 adults. Fieldwork was undertaken between18th-21st January 2013.The surveys was carried out online. The figures have been weighted and are representative of all UK adults (aged 18+). The 2014 Homeowner survey was made possible through the sponsorship by myhomemove, the UK’s leading provider of conveyancing services and TrustMark, the Government endorsed quality mark for tradesmen. 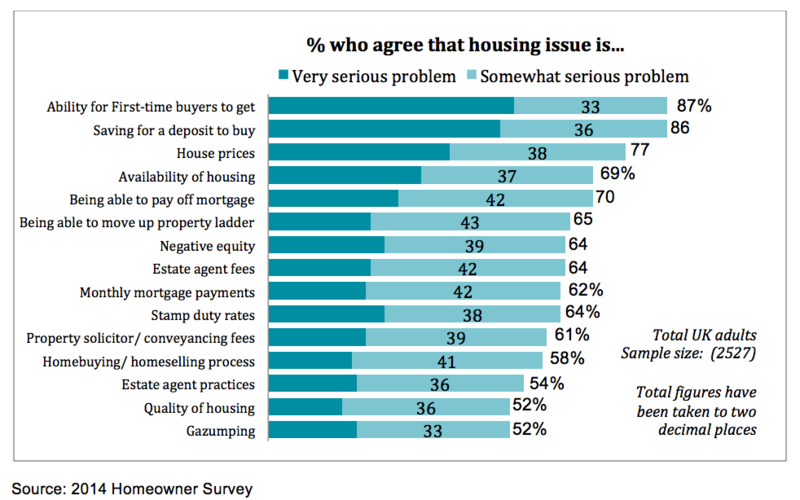 In the survey we asked whether particular housing issues were a very serious problem, somewhat serious problem, not a very serious problem or not a problem at all in the housing market at the moment and provided a list. The HomeOwners Alliance House Price Watch, is an average of the monthly and annual house price indices from Land Registry, Nationwide, Halifax, LSL Property Services and Hometrack and is issued in the first week of every month. Every month mortgage lenders, property professionals or government publish data on what is happening in the housing market. Often their views contradict each other – due to the way they calculate their estimates. For the latest House Price Watch report, infographic and information on what goes into the House Price Watch, click here. The HomeOwners Alliance champions the interests of Britain’s homeowners and aspiring homeowners. We are a consumer group providing helpful advice and services and acting as the voice of the homeowner in the media, lobbying for the interests of homeowners and aspiring homeowners in government, and campaigning against bad practices in industry. We directly engage with government and the media by conducting independent research and publishing reports that promote and champion the interests of homeowners.